In the first principles, we outlined the three planes of the world: The lower physical plane that represents the world around us, the middle mental plane through which we perceive existence, and the upper subconscious or spiritual plane were we find magic, spirits and the unknown. These three realms occupy nearly the same space, separated just a degree to create their positions; this degree of separation creates the vibration we understand to be energy. In this world, dichotomies do not exist, forcing us to analyze all angles of manipulating that vibration. We must also learn to work with or neutralize the natural rhythm of this world to achieve our best results. In today's principle, we'll be taking a look at the laws that shape our responsibility in the manipulation of energy and how our manipulation is restricted by the laws of the world around us. And so the pendulum swing manifests in everything, in the laws that govern our universe, in the universe itself and in our own experiences. Newton's Third Law of Motion states that "for every action, there is an equal and opposite reaction." The Principle of Cause and Effect agrees with this, emphasizing the swing of the pendulum we create in our own lives, even if we're not privy to it. The importance of this clause is our awareness of that action instead of simply being a mere spectator to the reaction. Sometimes we get so caught up with the effect that we become passengers in our lives. For lack of a better analogy, we watch the drama unfold like a movie and react with emotion instead of peering behind the screen to find the controls and change the direction. Once we become aware that every effect has a cause, that chance does not exist, we can focus on the causes and manipulate those to achieve our desired effect. We and we alone are responsible for ourselves, our vibration, our motion. Master your mind, control your thoughts, and direct them with reason and punctuation. What you see will influence what you think will influence what you believe will influence what you think will influence what you see. And so the pendulum swings yet again. Every thought you choose sets the tone for the way you perceive the world, shaping that mental lens through your experiences. But notice how I worded that sentence: Every thought you choose. Sometimes, we don't have control over our thoughts. If our mental lens is lacking in the proper physical plane nutrients and chemicals, if we've been exposed to damaging experiences, then sometimes we have intrusive thoughts. I too experience this as someone with OCD and depression. I'm here to tell you that intrusive thoughts are not the same as the thoughts we choose and we are not "at fault" for them. This mode of thinking is incredibly obsolete. That being said, we can still take responsibility for them. We can seek out medication and therapists to help us rewire our mental lens. We can recognize our triggers and responses, creating a pattern that helps minimize those intrusive thoughts, if possible. We can surround ourselves with others who understand what we're going through and can offer us emotional support, helping to strengthen our own mental lens. We can join online groups and therapy groups that help us to better understand our experiences. Even if we do all of the above, intrusive thoughts can still occur and, while they are not our fault, we are still trying to be responsible and manage them accordingly. And this, my friends, is healthy. As with all things - the three planes of existence, the pendulum swing, the vibration of energy - all things seek balance. Just as Newton's law states, the reaction is equal and opposite, balancing the initial action. In this, we can take some solace. With every gain, there is a loss. With every pull, there is a push. The rich man often lacks the love the poor man experiences. The overindulgent pay their price. No one can, as the phrase states, "have their cake and eat it too." You have to choose. So when we feel as though the universe has clearly "favored" another in effect, we must instead look towards both the cause of that favor and the supposed "favor" as the cause, resulting in a certain secondary effect. As with all laws, there is no escape from cause and effect and, as the balance is struck, those who give will be able to take, and those who take must give. Previously, we saw intent as a spherical ball with no poles aimed at the three realms in conjunction with the swing of the pendulum. But just who exactly is aiming that ball of intent? We are, of course. We generate the cause and we perceive the effect. If we are adept, we are able to identify all the potential causes and effects of a single action, utilizing the surrounding circumstances to achieve the most optimal and desired outcome. When we cast spells, we become the cause and learn to control the effect. In this, awareness is key. If we want to create the proper effect, we must analyze every aspect of the cause - from the degree of perceived polarity to the natural swing of the pendulum to the way that intent is going to pass through each level of vibration and each realm of existence. What does that intent mean physically, mentally and spiritually? What are the factors that could cause one, or all, to go awry? How can we best aim our intent to produce the proper vibration in conjunction with the other factors? Even more so, we must realize that we cannot begin to even control the effect without acting on a cause. We cannot learn how the effect the outcomes without dipping our toes in the water. Begin now by planting the seeds of your desired life and cultivating them. Utilize what you know now and begin work! Cast a spell and chart its outcome. If it doesn't create the desired effect, analyze why and try again. By keeping the energy flowing, we open the doorway for the wanted effect rather than being blindly driven by that effect in the first place. 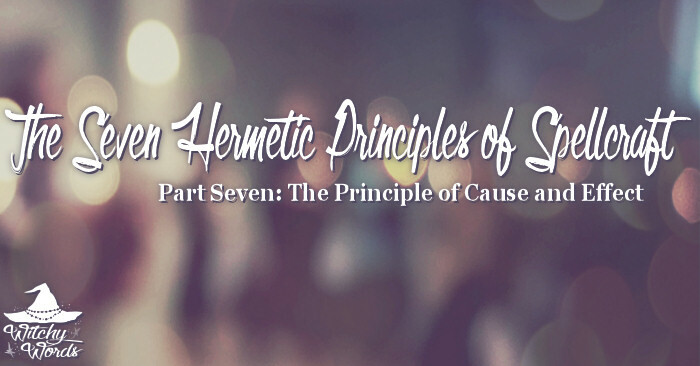 Part One: What is Hermeticism? I've been reading your blog almost every day since I started my path in The Craft like...three months ago. I read you and flyingthehedge. This article...this one, though. "Every thought you choose sets the tone for the way you perceive the world, shaping that mental lens through your experiences. But notice how I worded that sentence: Every thought you choose. Sometimes, we don't have control over our thoughts. If our mental lens is lacking in the proper physical plane nutrients and chemicals, if we've been exposed to damaging experiences, then sometimes we have intrusive thoughts. I too experience this as someone with OCD and depression. I'm here to tell you that intrusive thoughts are not the same as the thoughts we choose and we are not "at fault" for them. This mode of thinking is incredibly obsolete. That being said, we can still take responsibility for them. We can seek out medication and therapists to help us rewire our mental lens. We can recognize our triggers and responses, creating a pattern that helps minimize those intrusive thoughts, if possible. We can surround ourselves with others who understand what we're going through and can offer us emotional support, helping to strengthen our own mental lens. We can join online groups and therapy groups that help us to better understand our experiences. Even if we do all of the above, intrusive thoughts can still occur and, while they are not our fault, we are still trying to be responsible and manage them accordingly. And this, my friends, is healthy." I have complex PTSD and am currently in therapy. I needed to read that. I needed someone in the craft to acknowledge that someone can have intrusive thoughts and...still be a witch. Thank you. I'm so glad this article could help! I find that some New Age interpretations of Hermeticism push mental health to the side or see it as a flaw that prevents the practice of magic. That disappoints me. As our understanding of mental illness evolves, so too should our understanding of magic and spirituality. As long as you're doing your due diligence to take care of yourself, whatever that may mean, then you're following this principle perfectly, even if those thoughts creep in. I hope all is well and best wishes to you!